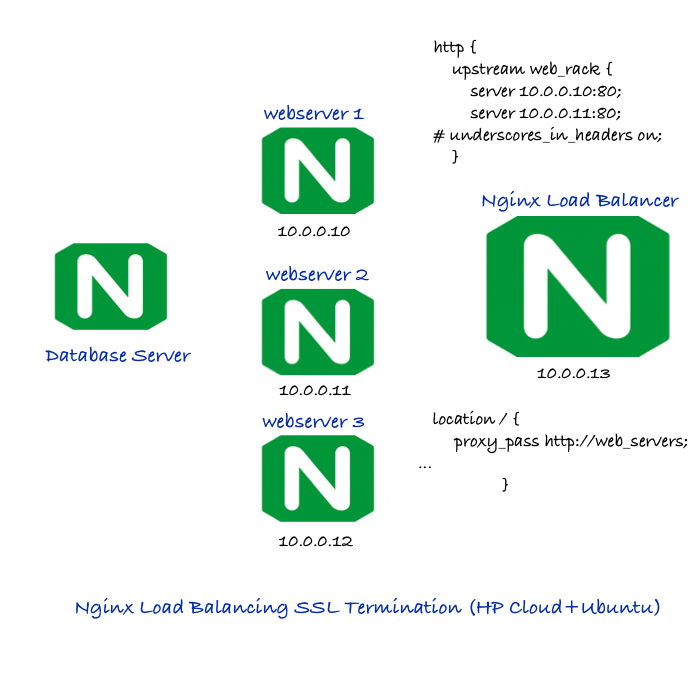 Here is How To Setup Nginx Load Balancing SSL Termination on HP Cloud Running Ubuntu Latest Version. Supported by both Nginx Free Ed. & Plus. For HP Horizon Cloud, we need some special extra steps for the first time as there is router. The commands, definitely will remain the same for any cloud service provider. We are taking it granted that, the reader has configured router and security group properly. Two other servers, which will act as backend are working fine. Nginx, both community version and the paid Nginx Plus can be configured as a load balancer to distribute load to the backend servers. As SSL termination occurs on the load balancer so SSL/TLS configuration must be done on the server instance we are talking about. We will not discuss about this part in this guide. For one website setup, frankly we can do the works only on /etc/nginx/sites-available/default file. As Nginx Plus uses the nginx.conf, we have shown this kind of setup. This Article Has Been Shared 1209 Times! Cite this article as: Abhishek Ghosh, "Nginx Load Balancing SSL Termination (HP Cloud+Ubuntu)," in The Customize Windows, June 7, 2015, April 25, 2019, https://thecustomizewindows.com/2015/06/nginx-load-balancing-ssl-termination-hp-cloudubuntu/.